Almost all Windows & Mac programs use the same techniques to Cut (Move), Copy and Paste files and folders from one location to another. 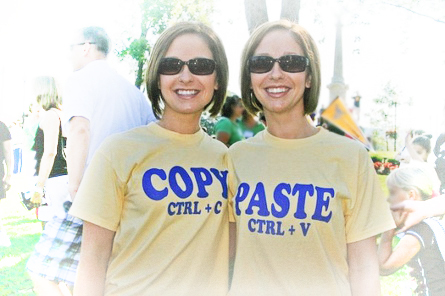 Go to 'Edit' at the very top of the program, and select 'Cut' or 'Copy' (they will be grayed out if nothing is selected), then go to the destination folder, then go to 'Edit' and select 'Paste'. With your file(s) or folder(s) selected, hold the 'Ctrl' (Control) key and tap the 'X' key for 'Cut' or hold the 'Ctrl' key and tap the 'C' key for 'Copy', then go to the destination folder, hold the 'Ctrl' key and tap the 'V' key for Paste. In Windows& Mac computer speak, Cut or Copy puts things on the clipboard; in layman's terms, they are held in memory. Only the last Cut or Copy is held in memory. You'll find these and other keyboard shortcuts to the right of the associated commands under File, Edit, View, etc., drop-down menus. The underlined letters means to use the 'Alt' plus letter key to access those. Experiment! What if you have a bunch of things to move or copy? To select everything in the open window, go to 'Edit' and 'Select All' or simply press 'Ctrl+A'. Or click on the first item, hold the 'Shift' key, then click the last item and Presto! the first, last and all items in between are selected. To individually select items, hold the 'Ctrl' key while selecting. Okay, you selected a bunch, so you used one of the first 2 methods, but there's a few you don't want. Hold the 'Ctrl' and click to deselect the ones you don't want to select. You'll find the above methods work on Word documents, e-mail messages, web sites, picture & music folders and more. Sure, you can select by dragging your mouse, and sometimes it's quicker, but I find that method less precise. How many times have you clicked and dragged through paragraphs and paragraphs of text, then accidentally loose contact with the highlighted items and have to start over? See also: CD Burning Secrets.